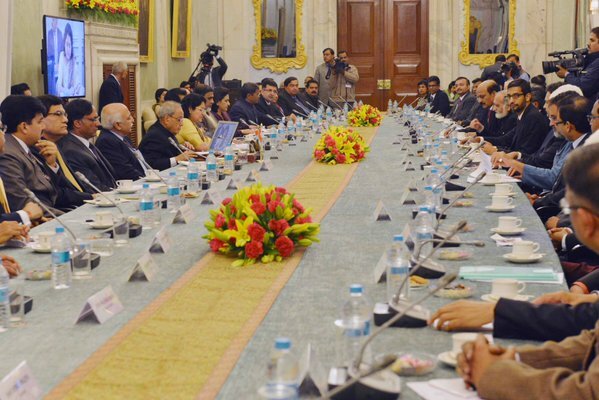 The President of India, Shri Pranab Mukherjee hosted roundtable discussions on‘Technology, Innovation and Education’ on Thursday at Rashtrapati Bhavan. Addressing the participants of the roundtable discussion, the President said that a new India is emerging with the youth looking forward to the future, ready to face challenges and truly believing that the world belongs to them. He was speaking after an interactive session when some of the participants presented ideas to re-enforce the positive impact of technology in education. He expressed optimism that a new India will emerge out of the brilliant young minds of India. They will create a new India out of its oldest civilization. The President said that with over 700 universities, 47,000 colleges and other institutions and over 1.4 million schools,India has an enviable educational infrastructure. There is also no lack of talent or capacity. However, as he has been repeatedly emphasizing in every educational congregation, there is need for more educational institutions to be higher up in the world class rankings. He expressed hope that valuable insights at the forum on transforming the education system through technology and innovation would aid India’s policymakers and other stakeholders in this regard. The President said that all the participants of the roundtable discussions have innovated new products to create wealth. With their expertise and drive, they could achieve even greater success. Among the dignitaries who participated in the discussions were Shri SundarPichai, CEO, Google Inc.; Shri T V Mohandas Pai, Chairman, Manipal Global Education Services; Shri BVR Mohan Reddy, Chairman, NASSCOM and Exe. Chairman, Cyient Ltd.; Shri Amitabh Kant, Secretary-DIPP, Ministry of Commerce; Shri Sharad Sharma, Co-Founder, iSPIRT; Shri Krishna Kumar, Founder & CEO, Simplilearn; Shri Vijay Shekhar Sharma, Founder, PayTm; Shri Rahul Narayan, Tech Lead, Team Indus; Shri Shashank ND, Founder and CEO, Practo and Shri Rakesh Bharti Mittal, Vice Chairman, Bharti Enterprises.